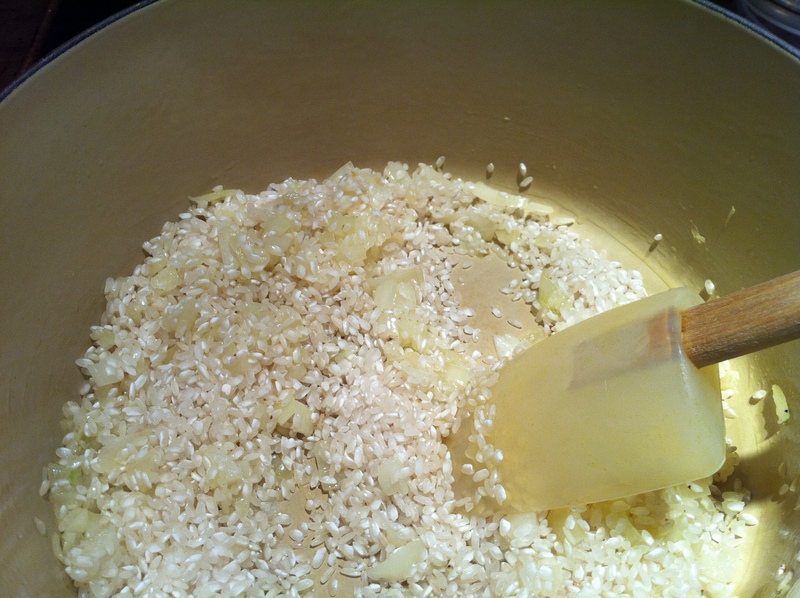 There are few activities as comforting as stirring an enormous pot of risotto… from the sautéing of the onions, to the grating of the parmesan cheese, it is an incredibly therapeutic experience. Absolutely perfect for a Friday night in after an incredibly long (and cold…) week. This is a great dish to add to your repertoire – if you have arborio rice on hand, you can really throw anything you want in to the risotto and 9 times out of 10 it will be delicious. A great way to clean out the fridge! This recipe makes about 4 QUITE hefty servings. 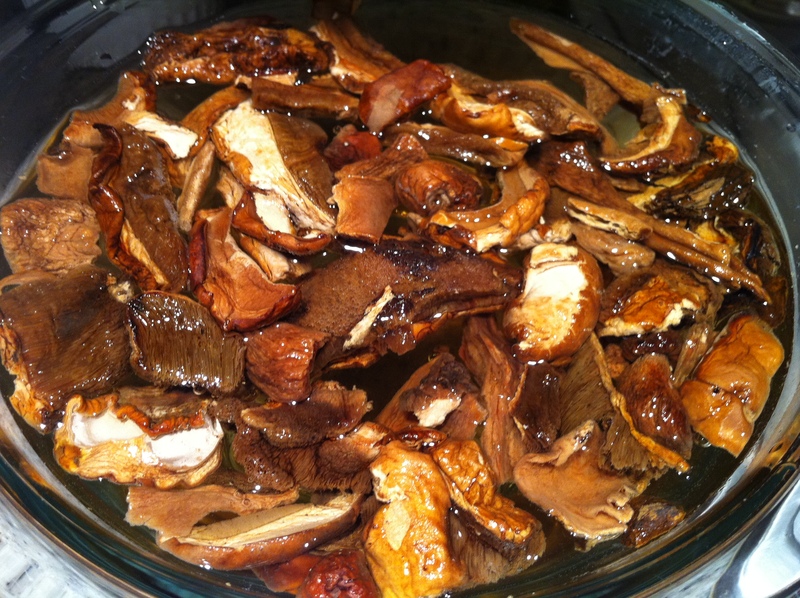 First, get the dried porcini mushrooms soaking in a bowl of hot water. They will need about 20 minutes (the package will give you the exact time). I think they smell a little foul, but they really add great flavor to this dish. Next, put about 2 tbsp butter and 2 tbsp olive oil (I actually used truffle oil because I was feeling a bit fancy) in a heavy pot or pan (I used my trusty kiwi-colored dutch oven). Add the chopped onion and sauté for a few minutes until translucent. 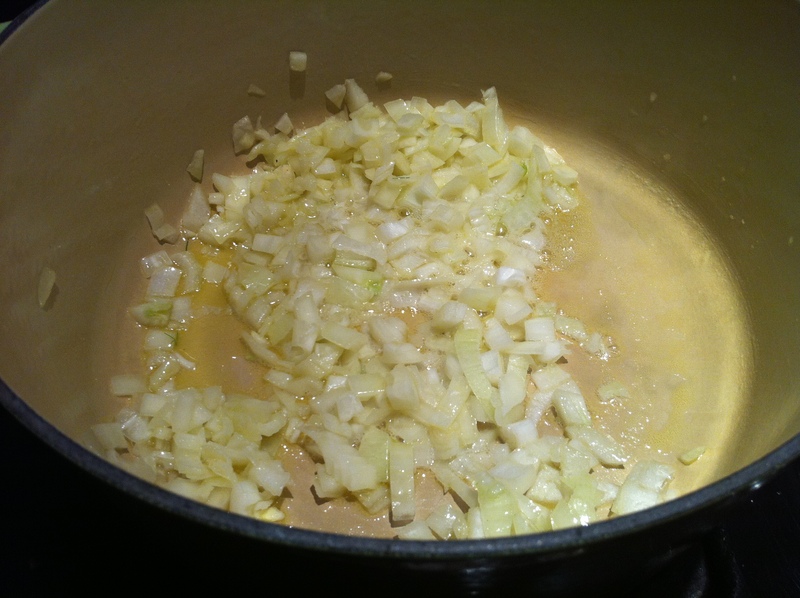 Then add chopped garlic. The sweet scent of sautéing onions and garlic is probably my all-time favorite. Next, add the arborio rice, and saute until coated with the olive oil, about a minute or so (this may seem strange, but it helps with the texture of the finished product). 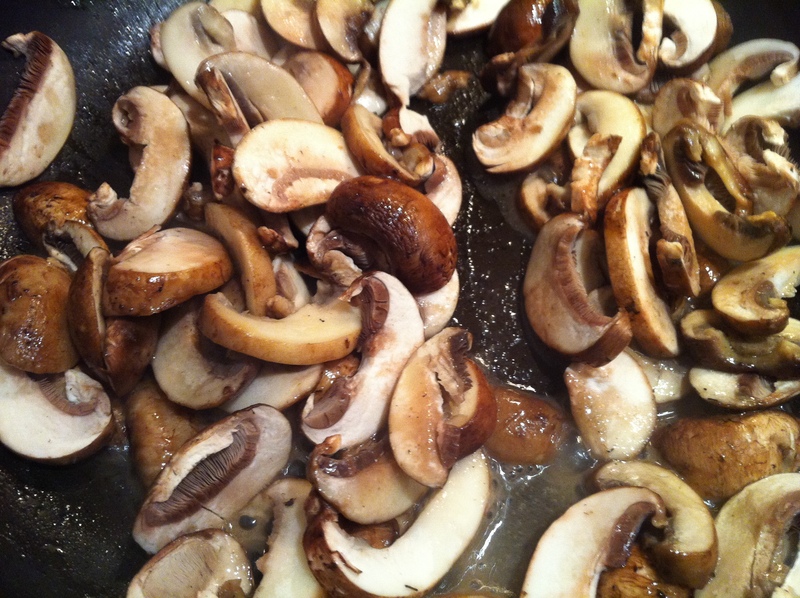 At some point early on in the process, get started on the cremini mushrooms. Remove the stems, wipe any really obvious dirt off with a dry paper towel, and slice. Put them in a frying pan with a bit of butter and olive oil and sauté until tender and lightly browned. Don’t neglect your rice though! About 1/2 cup at a time, add the wine and the warm chicken stock to the rice. Wait until the liquid is fully absorbed before adding more. I prefer to use more wine in my recipe, others use only 1/2 cup of wine and the rest chicken stock, it is really up to you and your taste preferences! Also, make sure to season with salt (not too much as the parmesan is salty) and pepper throughout. 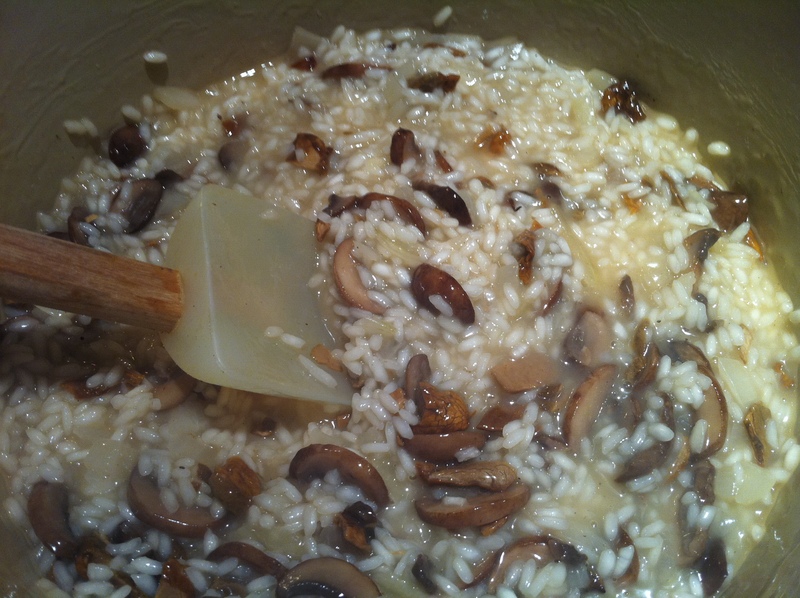 When the rice mixture looks like it is about 3/4 of the way done, add in the mushrooms. Cut up the porcini mushrooms if they are on the large side. 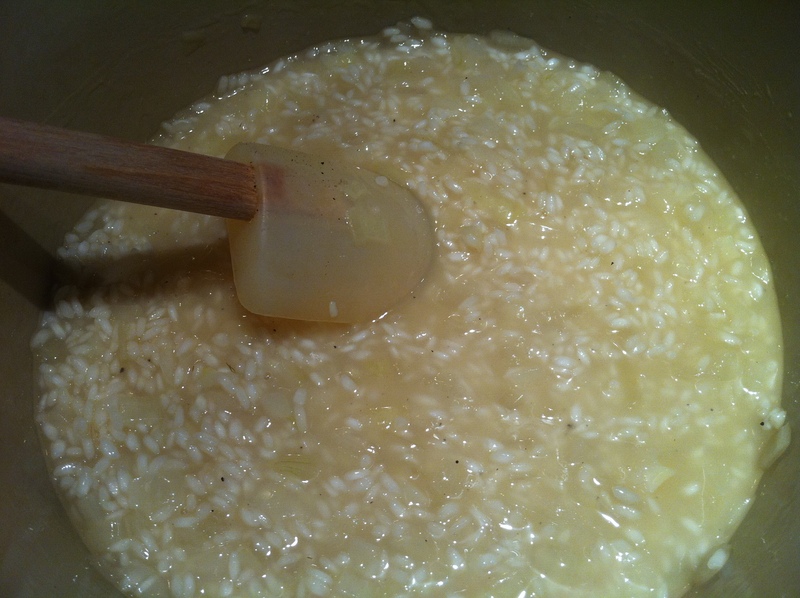 Continue adding the wine and chicken stock until the risotto is perfectly cooked, make sure to do taste tests every couple of minutes to avoid over-cooking. When you feel like the risotto is 98% finished, add in a dash of cream (this isn’t totally necessary but adds a nice richness) and the parmesan cheese. Heap onto plates and serve warm! YUM! 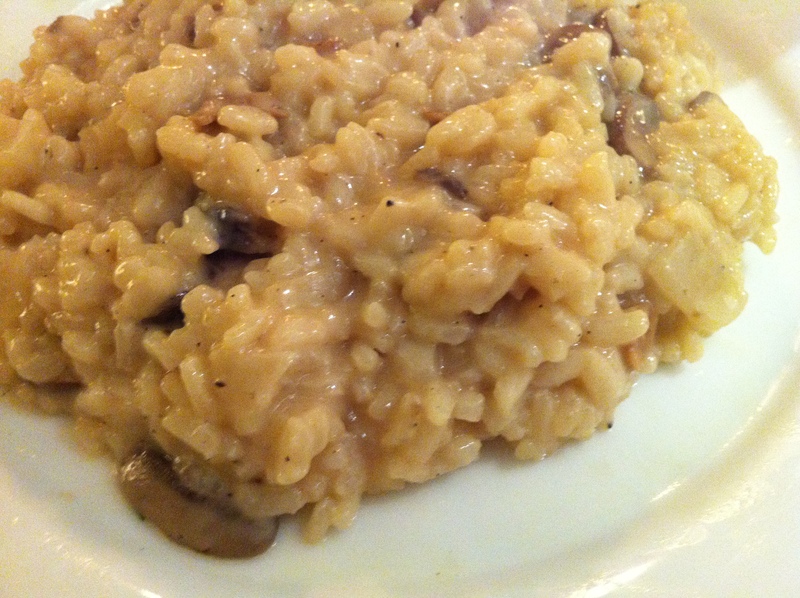 This entry was posted in Mushrooms and tagged arborio rice, cremini, dinner, garlic, mushrooms, onion, parmesan cheese, porcini, risotto, saute, white wine. Bookmark the permalink.